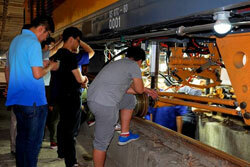 In September 2016 diagnostic railcar “Railway LAB Ultrasonic Test TVEMA 70” started regular operation in track diagnostics of Beijing Metro – second largest in the world in terms of length and load. Thus, our joint project with Chinese CSR Qishuyan Locomotive Co. Ltd. Corporation on creation of the diagnostic railcar for railways and metros, started two years ago has come to a successful end. Multi-level work of Company’s specialists on preparation and commissioning of the vehicle preceded this event. In a short time the whole cycle of commissioning works was performed as well as performance tests and training of the Chinese staff representing Beijing, Shanghai and Guangzhou metros. This cycle of commissioning works was done in rough competition with Sperry Rail Service American Company, which has been the supplier of diagnostic equipment to PRC markets for several decades. As a result of comparative tests our systems and equipment outperformed the American counterparts in the tough conditions of Beijing Metro both in quality and reliability. In the commissioning certificate officials of the Beijing Metro have specifically noted that hardware and software of our make has performed well in complicated diagnostic situation of Beijing Metro. Management of AO “Firma TVEMA” is confident that implementation of this joint project will allow the improvement of safety on railways and metros of China as well as press the competitors from the diagnostic tools market and gain a foothold as a leading supplier of diagnostic systems for railways and metros of PRC.